It was the heat of the summer – July 2014. Yes…think back with me. I was in my third month of Cuisine Cube and was sent a box full of goodies, most of which I have already used up. Only two remained. One is the Citrus Herb breadcrumbs, which is meant for chicken, but as a vegetarian, I’ll repurpose them (like on broccoli or tofu or something)…and the Lentilicious Mediterranean Lentils. If you’re veterans of my blog, you know all about the amazing delivery service that is Cuisine Cube. If you are new, then let me give you a quick run-down. Cuisine Cube is a gluten-free subscription box that specializes in pantry/meal items, delivered to your door once a month. Included are 5-6 products, not samples, but full-size products, that cover breakfast, lunch, dinner, dessert, a snack…and then an added bonus once and awhile. It’s fantastic. I’ve been introduced to products and small artisan companies that specialize in gluten-free products that I otherwise never would have known about. One of these is definitely Lentilicious. Lentilicious originated in a small town near Byron Bay, Australia. It was a startup company for two women who wanted to share their love of quick, easy and nutritious food – mainly lentils. Lentils are a nutrient dense “superfood” that cooks up quickly without having to soak them. Lentils are bursting with planty protein and dietary fiber, and red lentils, such as those found in Lentilicious meals, are low on the glycemic index and also low in fat. Lentilicious offers a package that is nutrient rich, quick to make, portable, and a surefire way to keep you full and provide sustained energy. Oh…it’s also good for you. So…now almost a year had gone by and these were still in my pantry. Definitely no good. I’m working my way through my pantry and freezer and finally getting to the stuff that I’ve put aside for way too long. I am so sorry that I waited so long to try the Lentilicious Mediterranean Lentils. Why? Well…you’re about to find out. First of all, Lentilicious meals are super easy to make. It takes 20 minutes of your day. That’s it. You can cook them in the microwave or on the stove. I opted for the stovetop…which was just more convenient for me. Either way…20 minutes. So, to prepare by stovetop, I simply poured the entire packet of lentils and spices into the pot and covered with 3 cups of cold water. I simply brought that to a boil, lowered the heat, and allowed it to simmer, uncovered, for 20 minutes, just stirring every now and again. That’s it. EASY! I cooked this up while I was cooking dinner. It required no extra supervision. Because, this was going to be lunch for my roommate and I for half of this week. Monday and Tuesday…this was what we were having. And, as it cooked up, I could already tell I was going to love it. In fact, I reheated these at work both days, and each day I was complimented on how delicious my lunch smelled. But, food is all about the scent and the flavor. So…it was time to give it a taste. Let me say this…AMAZING!! This tastes like a lentil chili. The texture and the flavors are phenomenal. I thought it was spiced up to perfection, with a mild hit of Mediterranean spices and this creamy, yet “meaty” dish. I was in love at first bite and would savor each spoonful. Total win! It was also filling and just tasty. Beyond impressed. Already making some plans to seek it out or at least order it online. With all that being said, let’s take a look at what goes into the Lentilicious Mediterranean Lentil Meal. This meal is made up of red split lentils, sundried tomatoes, onion flakes, sea salt, and contains less than 2% spices. That’s it. Clean eating, indeed!! This product is gluten-free, vegan, kosher, low GI, non-GMO, 97% fat free, high in protein and high in fiber. LOVE IT! 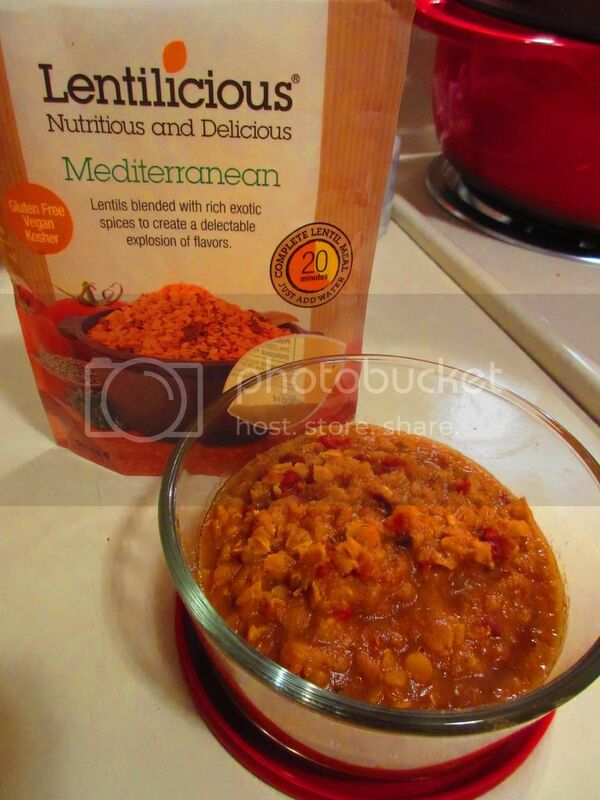 As for nutrition, a pouch of the Lentilicious Mediterranean Lentil Meal contains 4 servings. Each serving will provide you with 180 calories, 1 gram of fat, 240 mg sodium, 30 grams of carbohydrates, 8 grams of fiber, 2 grams of sugar, and 13 grams of protein. AMAZING! Lentils and I are BFFs forever. Once again, Cuisine Cube delivered an amazing product! Totally loving, and now on the hunt for, Lentilicious. If you are looking for an amazing plant-based source of protein…lentils are a fantastic choice. Even better…you simply have to add water to and cook up! Lentilicious for the big win! This entry was posted in Beans, Cuisine Cube, Entree, Food, Gluten-Free, Mediterranean, Products, Review, Side Dish, Vegan, Vegetables, Vegetarian by The Celiathlete. Bookmark the permalink.